It is natural for people to find themselves loosing stamina as they age. Aerobic capacity, muscle strength, and endurance all decline, but this is not an irreversible fate. Cardio exercises are an excellent means to improving stamina, controlling blood pressure, boosting energy, and strengthening the bones. There is no such thing as being “too old” to exercise. Specifically, cardiovascular exercise refers to workout activities that increase your heart rate for anywhere from 10 to 30 minutes. Cardio engages major muscle groups, improves blood flow, and improves overall oxygen dispersion in the body, due to a boost in heart and lung function. Cardio exercises can be combined with other activities like strength training or sports, or it can be done on its own. It’s important that you receive a full medical examination from your doctor before beginning your cardio training. Seeing your doctor and letting them know your intentions will allow them to offer guidelines and advice on how to manage your workouts safely. Additionally, age also presents other complications that could interfere with the workout, or you may have underlying medical conditions. Once you get the green light from your doctor, you’ll be good to go. It helps to plan in advance how much time you’ll be spending on your workouts. Barring other health conditions, the average healthy adult over age 65 should aim for around 150 minutes of moderately-intense cardio exercises every week. Be sure to drink water before, during, and after your exercises. Staying hydrated is a basic and important element of workout safety at any age. Additionally, stop or slow down immediately if you feel dizzy, experience chest pain, or are breathing so hard you can’t talk clearly. This is a sign that you are exceeding your limit. Take a break and if you resume, do so at a lower intensity until you consult with your doctor. Low-intensity activities are those that only mildly increase your heart and respiration rate. They’re suitable for a wide spectrum of seniors including those with various medical conditions that affect their ability to exert themselves. 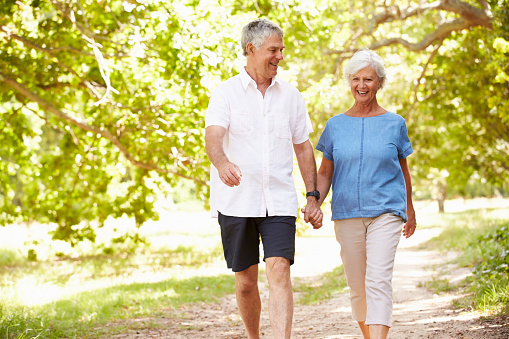 Walking is a standard form of cardiovascular exercise. A stroll down the sidewalk, around the block, or even walking down a grocery aisle when shopping all count towards your weekly 150 minutes. When walking, make sure you use a flat, level surface and wear comfortable shoes. Start at a slow pace, but feel free to increase as you get more confident. Swimming is another low-intensity activity that offers good cardio benefits. As an added benefit, being in water helps ease and relieve joint strain and pressure. Access to a pool can be found at many community centers or gyms. Some gyms may also have recreational swimming classes tailored specially for seniors. These aren’t necessary, but can certainly help. Moderate exercises raise your heart and breathing rates more than those discussed above. As a result, they may not be suited for all seniors. A general rule for identifying if something is of moderate-intensity is if you can talk clearly, but not sing. If you have grown comfortable with walking and wish to try something more, consider hiking. The often sloped and uneven surface of hiking trails will produce a stronger workout than a stroll down the street. Swimmers looking for a new option should try swimming laps as well. Like hiking, this is more vigorous than the low-intensity version, but remains moderately gentle. New activities are also available at this point. A proper warm-up followed by light jogging in five-minute stretches can be a good experience. Biking is also possible, but a stationary bike may be advisable if you find you have difficulty balancing. A more social and musical option is to take up dance. You can join a dance class at a gym, community, or senior center and enjoy some jazz, ballroom, and more. Like swimming, there are also dance classes specifically tailored for seniors. High-intensity cardio workouts push your heart and breathing to the point where talking can become difficult. One minute of high-intensity exercise is worth two minutes of moderate or low-intensity exercises. This means your 150 minutes of exercise per week could be cut down to 75 minutes. High-intensity cardiovascular exercises also place extra stress on the joints and have a higher risk of injury. Be sure to consult your doctor before beginning this level of activity. Longer or faster jogs and biking uphill are examples of high-intensity exercises that will put your heart and lungs to work. Shoveling snow or raking large amounts of leaves can also fall in this category, but be careful not to overdo it and wear clothes appropriate for the weather. Cross-country skiing, rowing, or using exercise machines that mimic the motions of the activities, will also increase the potency of your workout. Leg exercises: Sit in a chair with your back upright and feet firmly planted on the ground. Lift one leg until the knee is straight and hold for three to five seconds. Return the leg to the starting position with both feet on the ground. Do the same motion with the other leg. Repeat the series eight times on each side. Chest stretch: With a wall behind you, sit in a chair upright with your feet planted on the ground and hands on your knees. Raise your arms up and interlock your fingers behind your head. Inhale carefully and try moving your elbows back to touch the wall behind you. As you exhale, bring your arms and hands back to the starting position. Repeat three times. Triceps extension: Sit in a chair upright with your feet planted firmly on the ground and with a light weight in your left hand. Bend and raise your left elbow up so that it rests near your ear. The elbow should be facing upwards and your forearm should be pointing behind you, with the weight in your hand near the back of your left shoulder. Use your right hand to support the left elbow and then slowly straighten your left arm up towards the ceiling. Hold for three to five seconds and lower your arms to the starting position. Repeat eight times and then switch arms. Senior centers, community centers, and gyms are likely to have various aerobic or workout programs you can try. Not only does this give a tailored environment for your strength training, it also affords you talented instructors and specialized equipment. Morell, K., “Cardio, Strength Training Tips for Seniors,” Go Red for Women web site; https://www.goredforwomen.org/live-healthy/heart-healthy-exercises/cardio-strength-training-tips-for-seniors/, last accessed September 18, 2015. O’Brien, S., “Cardio Exercises for a Healthy Heart,” About.com; http://seniorliving.about.com/od/basicexerciseseries/ss/cardioexercise.htm#step1, last accessed September 18, 2015. “How much physical activity do older adults need?” Centers for Disease Control and Prevention web site, last updated June 4, 2015; http://www.cdc.gov/physicalactivity/basics/older_adults/, last accessed September 18, 2015. Wahlig, H., “Cardio Exercises for Seniors,” LIVESTRONG.COM, January 13, 2014; http://www.livestrong.com/article/100890-cardio-exercises-seniors/.